PASADENA, Calif. (CN) — A sculptor whose work was copied by real estate billionaire Igor Olenicoff, the world’s 156th richest person according to Forbes, is entitled to collect the $450,000 a federal jury awarded him, the Ninth Circuit ruled Monday. In 2004, Donald Wakefield, who creates large sculptures out of stone and metal, was seeking buyers for his work in Southern California. One of these buyers was Olen Properties Corp., Olenicoff’s real estate business, and Wakefield sent the company a link to his website, which contained pictures of his work. Four years later, Wakefield saw one of his pieces, “Untitled,” at an Olenicoff property in Newport Beach. At the time, Wakefield believed he was looking at his own, original work. But in January 2010, he saw more sculptures at other Olenicoff properties that were either exact replicas of or derivative of “Untitled.” In addition to the Newport Beach piece, Olenicoff had commissioned six copies of Wakefield’s work and had them manufactured in China. Wakefield and another artist, John Raimondi, filed concurrent lawsuits in December 2012 for copyright infringement against Olenicoff and Olen Properties Corp. In June 2014, a federal jury found in Wakefield’s favor and awarded him $450,000 in actual damages. The court also ordered that the sculptures be destroyed or turned over to Wakefield (Olenicoff elected to have them destroyed), but vacated the damages. According to the blogazine “Hyperallergic,” Raimondi was also successful in his lawsuit and was awarded $640,000, though the court ordered that the sculptures, rather than be destroyed, should have plaques included that identify Raimondi as the artist. On Monday, the Ninth Circuit panel found Wakefield’s money award appropriate. “The jury’s award of $450,000 in actual damages was ‘sufficiently supported by evidence’ and was ‘non-speculative,’” the panel wrote. “From the evidence presented at trial, the jury could have determined that the actual use made by defendants of plaintiff’s work was worth $75,000 per infringing copy.” However, the trial court properly granted summary judgment to Olenicoff on Wakefield’s claim for indirect profits. Olenicoff sought partial summary judgment on statute-of-limitations grounds regarding Wakefield’s discovery of the infringed-upon sculptures. 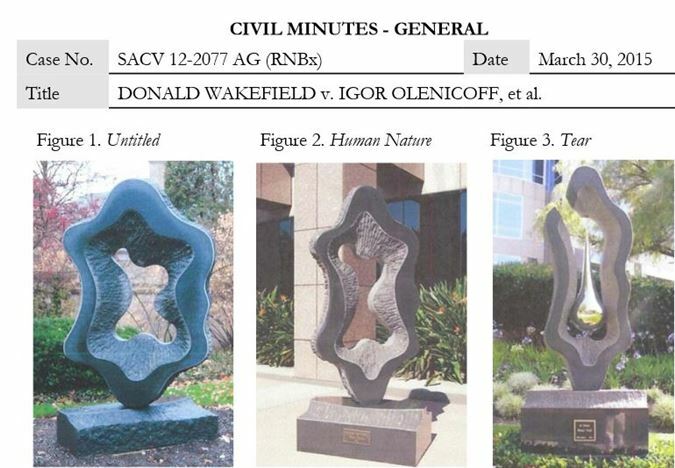 The trial court granted the motion in regard to the Newport Beach sculpture, but denied it for the other six works. The Ninth Circuit found that the trial court should have denied both motions. “A reasonable jury could find that plaintiff had neither actual nor constructive knowledge … that the first sculpture was a copy of ‘Untitled,’ rather than ‘Untitled’ itself,” the panel wrote. The panel also wrote that the trial court had discretion to order that the infringing sculptures be destroyed. “I have a great admiration for the creativity and passion that artists bring to their work,” attorney Gene Brockland, who represented Wakefield, said in a statement. Brockland is with Herzog Crebs in St. Louis. Eric Schiffer & Buss in Costa Mesa represented Olenicoff. “We disagree with the court’s decision in this case and believe Judge Guilford’s previous ruling vacating the jury’s damage award properly applied the law pertaining to damages in this unusual set of circumstances,” he said in an email, adding that he was not surprised given that the court usually prefers to defer to jury verdicts. He also said he and his clients are currently deciding what to do next. The panel consisted of Ninth Circuit Judges Susan Graber, Jay Bybee and Morgan Christen.